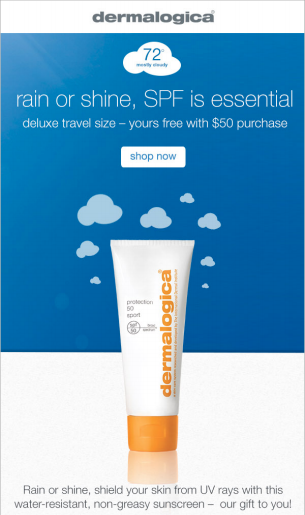 We work with brands that are consistently raising the bar when it comes to innovative and personalized emails. So, we knew that we had to come up with a list of a few of our favorite examples. Let’s take a look back at 10 of the most compelling client emails from 2018. Verizon’s My Rewards+ Quarterly Statement is powered by an API that shows total reward points, quarterly activity points, how close users are to achieving various rewards, and a checklist of tasks the user has completed or has yet to complete. The campaign was a hit with customers and even won Verizon an award from the Email Experience Council for Best Use of Data. When it came to kicking off Movember 2018 with an exciting email experience, their marketing team knew Movable Ink’s personalization capabilities and augmented reality experience was the way to go. If subscribers opened the email on the mobile device’s native mail app, they’re shown creative suggesting either the Mo Sista or Mo Bro filters. From there, subscribers are led to a Custom AR experience where their name is overlaid onto a frame. Using Movable Ink along with CrowdTwist, Philosophy could automatically pull loyalty information — like recent purchases and other interactions with the brand — and use it to power a “Gratitude Meter” in the body of the email. Additionally, they pulled in the number of points needed to reach the next tier and other ways to earn points. The result was a beautiful, personalized email that was unique for every Philosophy customer. Since real estate listings change so often in New York, StreetEasy needed a scalable way to make sure each user received listings and content that was tailored to their preferences and budget. They used Movable Ink’s web crop capability to power dynamic content that changes to reflect each user’s preferred neighborhood. The email’s modules are targeted by neighborhood preference and pull content directly from available listings and neighborhood guides, so their team can serve up as many different variations as necessary from a single template. 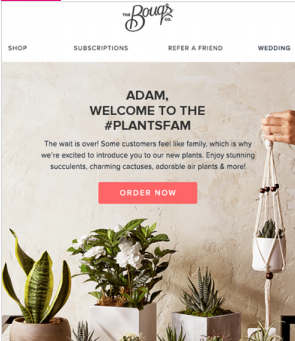 The Bouqs Company created a stunning curated floral collection that they promoted with real-time inventory in email and on their website. To drive engagement, they used a live poll to drive customers to choose their favorite arrangement. To lift AOV, they targeted personalized creative to customers that preferred larger arrangements on their product detail page. To drive landing page conversions, they added each customer’s first name and thanked them for being a customer along with the number of years they’ve shopped with the Bouqs. 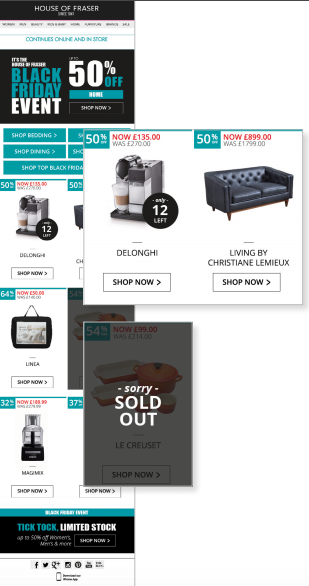 When it comes to Black Friday, House of Fraser knows the importance of promoting in-stock products in its emails, regardless of whether an email is opened minutes, hours, or days after it was sent. So, their team used web-cropping and API feeds to pull live product information and availability directly from their website. Each month, those athletes look forward to their recap email from Strava that highlights their activity from the previous month. Strava created a custom image for social media and used Movable Ink to automatically merge in variables to generate personalized images for each athlete. They also added a call-to-action that made it easy for athletes to share their #StravaStats. The NBA needed to create an email that would be useful to every fan, regardless of country or day of open. But with subscribers in over 50 countries and with over 50 games a week, it would be a challenge to personalize every email at scale. That’s why they created their League Pass weekly newsletter with Movable Ink. The email included up-to-the-second game day information, so fans would see the upcoming games no matter what day or time the email was opened. The NBA also included an add-to-calendar feature so fans wouldn’t miss a tip-off. Finally, they included the top three news stories from NBA.com that were relevant to each fan’s favorite team. ADT created their Pulse Monthly Usage Statement email with the goal of encouraging customers early in their lifecycle to increase their usage of their ADT system. The email displayed how many times a user armed and disarmed their system, and compared those stats with the stats of other users. At the bottom, it showed customers tips for increasing their usage. Thanks to Movable Ink, ADT was able to easily use their data to power a set of compelling visuals. And their customers agreed: 82% of recipients said the email was helpful, and they saw a 3x lift in open rates. Want to learn more about our visual experience platform? In this guide, you’ll learn how Movable Ink’s platform helps digital marketers create unique experiences at scale across email, web, and display – all while streamlining production and supercharging their existing martech stack. This entry was posted in Content Marketing on February 1, 2019 by Carine Alexis.